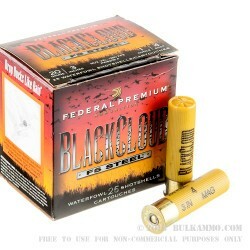 When it comes to 20 gauge ammo, Black Cloud might be the premier choice for hunting waterfowl. The introduction of Black Cloud to the duck has changed the game. Today, steel ammo is as lethal, if not more than the brass ammo of the past. These 20 gauge 3-inch #4 shotgun shells are the perfect choice for hunting early migrating ducks like Teal and Wood Ducks. These rounds provide the knockdown power and the speed that is required for smaller ducks with a muzzle velocity of 1350 feet per second. It also holds the best pattern for waterfowling by keeping a consistent shot group at close range and up to twenty-five yards. Federal revolutionized duck hunting with the flitestopper pellet. It creates a larger wound cavity than traditional steel and has earned its reputation for being lethal in the duck hunting community. 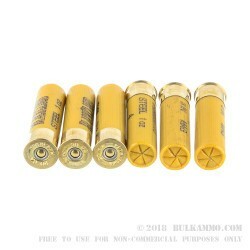 This bulk package has 250 rounds that are in separated into 10, 25-round boxes. 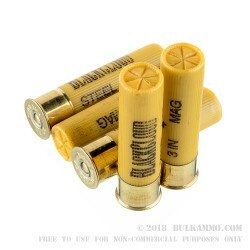 When you Buy this bulk package you will be sure to have enough ammo to last the season. 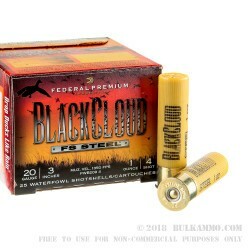 Never before has steel been as lethal as Black Cloud ammunition from Federal Premium.